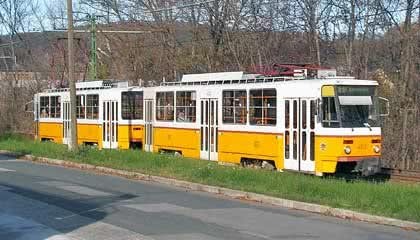 Szechenyi-hegy Station of the Children’s Railway can be reached by public transportation as follows: Take Tram No 59 or 61 at Szell Kalman ter (Moszkva ter) to Varosmajor stop. 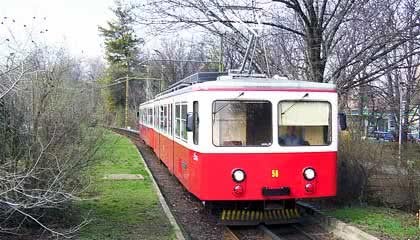 Change to the Cogwheel Railway (Service No 60) and ride it to Szechenyi-hegy, Gyermekvasut terminus. Proceed on foot along Golfpalya utca. By car: Take Alkotas utca at Deli palyaudvar (South Railway Station). Proceed on Nagyenyed utca, Istenhegyi ut, Kolto utca and Eotvos ut until the parking lot next to Normafa Halting. Turn left and continue on Hegyhat ut until you reach Szechenyi-hegy Station. There is a free parking lot with limited capacity adjacent to the station. Normafa Halting can be reached by public transportation as follows: Take Bus No 21 or 21A at Szell Kalman ter (Moszkva ter) to the Normafa, Gyermekvasut stop. By car: Take Alkotas utca at Deli palyaudvar (South Railway Station). Proceed on Nagyenyed utca, Istenhegyi ut, Kolto utca and Eotvos ut. There is a free parking lot adjacent to the halting. Szepjuhaszne Station can be reached by public transportation as follows: Take Bus No 22, 22A or 222 at Szell Kalman ter (Moszkva ter) to the Szepjuhaszne, Gyermekvasut stop. By car: Take Szilagyi Erzsebet fasor and Budakeszi ut until you reach a railway bridge. Turn right before passing under the bridge. There is a free parking lot adjacent to the station. Huvosvolgy can be reached by public transportation as follows: Take Tram No 61 at Szell Kalman ter (Moszkva ter) to the Huvosvolgy terminus. Take the case of stairs and the station is located at a short walking distance. By car: Take Szilagyi Erzsebet fasor and Huvosvolgyi ut. Pass the Huvosvolgy tram and bus terminus and shortly turn left twice. There is a large P+R parking area nearby the station.